Hal Witherwox ties flies at Black Bar Lodge with legendary Rogue River guide and dory-boat (drift boat) designer Bob Pritchett looking on. 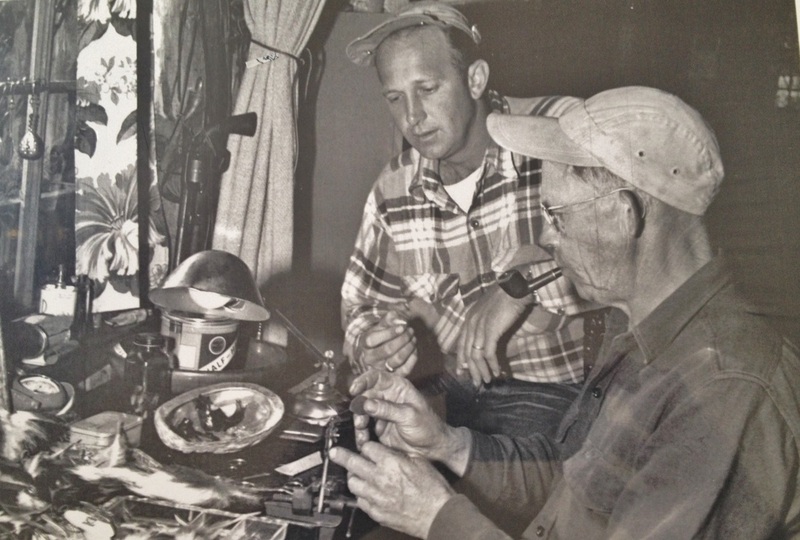 Longtime Rogue River guide Ray Slusser recently provided me with quite a pleasant surprise when he sent me a large black-and-white photo of Hal Witherwox tying flies at Black Bar Lodge, with legendary Rogue River (Oregon) fishing guide and dory boat designer Bob Pritchett looking on. Moreover, Ray included a Witherwox Special tied by the originator, these items being gifts from Steve Pritchett, Bob's son. Bob Pritchett guided for Glenn Wooldridge, equally famous for his Rogue River boating exploits, and during the 1950s Pritchett made critical modifications to the Rogue River dory that would cement this craft as the standard by which future river-running drift boats would be measured. Ray reminded me in his note that these days, and for quite some time, the Witherwox Special has been known to most people as the "Old Mare." The Witherwox Special shown in Classic Steelhead Flies, tied by the late Al Brunell, who at one time, while living in Gold Beach, tied the old Rogue River standards commercially (and beautifully). Al's version in the book has a tail of mallard flank; the Witherwox shown here has a tail of red hackle fibers. I'm not sure if Hal Witherwox at one time tied it with mallard, but steelhead fly designers notoriously tinker with their own patterns. In the early 1900's, all the mail was carried by horseback. Frank Colvin once carried the mail from Gold Beach to the Irma Post Office, about twenty-two miles south. "I went to the Gold Beach Post Office at 6:00 a.m. and Charles Dewey, postmaster, swore me in and signed me up as a substitute mail carrier. He gave me the mailbag and several small sacks, one for each mailbox on the route. I started south at 6:15 and saw Dennis Cunniff, Sr. on his way to milk his cows. He came to Ellensburg in 1858 with his wife and stepdaughter Eliza Ann Graham, then aged fourteen, who was murdered in 1861 near her home. Two men were hung for the murder by the miners' vigilantes. I went on to Hunter Creek and saw Antone Defonte who claimed to have walked from St. Louis to San Francisco. He homesteaded at the mouth of Hunter Creek in 1855. Just above the bridge lived a German, Chris Ringe, who deserted the German Navy. He homesteaded his ranch in 1855 and lost his house in the flood of 1890. Next was the Robert Smith ranch where the Indian girl who saved him from the Indians at Chetco during the Indian War lived. Smith later married the girl and raised a family of ten children, four boys and six girls. The last two were twins, Grace and Louisa, educated at Carlisle. One of them was dark and the other light, and they both passed away at about age thirty. The boys' names were Emil, Albert, Julius and Robert. The girls were May, Lizzie, Florence, Emmie and the twins. Their mother's Indian name was Skamamahtra. Just around the point about half a mile lived the Collins family who had three girls and two boys. They homesteaded on Hunter Creek in 1869. Their names were Fannie, Katie, Josie, Jimmie and Jerry. Jimmie was drowned fording the Rogue River at Elephant Rock. Next we came to the Hardy ranch, owned by John and James McVay. They came here in the early days from Ireland. They raised sheep and mined gold on the beach in the winter. John had two girls. Jim had a wife, but no children. On up the hill we came to Frankie Daniels' who came from an Island in Greece. He claimed to be the first man to pilot on the Columbia River Bar in 1850. He also knew my mother in Tillamook in 1850. Her family had six hundred acres right where the city is today. Over the mountain and down across Myers Creek was Conn Megen's. He had about a thousand acres of Myers Creek and raised sheep. He was from Ireland. Next we came to James G. Walker's at Pistol River. He was from Canada and had five boys and one girl named Maude. She was a school teacher at the time. The boys names were Will, Robert, Claude, Arthur and Sydney. Next came the A. H. Crook ranch which was very large and ran on both sides of Pistol river. They had three boys. Theron Junior, Will and John. We changed horses there. Then we went on up the river about half a mile to Bridge Point where the bridge had washed out in the 1890 flood. The Lawrence ranch was just about the point where Grandma Lawrence lived with her three boys and her two orphaned granddaughters, Ruth and Oleta. The boys names were George, Al and Ed. We forded the river and came to great-great Grandpa Crook's place. His real name was Theron Crook, Sr. There were several mailboxes for people who lived up the river. There were two families of Ismerts and John Cadago, from Italy. Then we left the river and climbed the mountain on an old wagon road. Up we wound and finally came to the Clark ranch where the Irma Post Office was once located. When the Clark children married, the post office was moved to the Hardenbrook ranch further down. We finally got there and delivered the mail and met the mailman from Harbor, who was Tom Van Pelt. We fed the horses and then had a nice cold lunch which cost twenty-five cents. One o'clock came too soon, but we started back. Tom going south and I north. We gathered the small mailsacks as we went, as they would need them for the next day. We changed horses at Pistol River both ways. I was mailman for just one day and I have written this from memory." Jim Adams is a wealth of historical information and it's too bad younger fly anglers don't know who he is. Jim has been a dealer of rare sporting books, rare bamboo rods, and collectable fly reels for 40 years (see www.adamsanglingbooks.com). Among many other accomplishments and associations, Jim was the man who originally prompted the legendary Woody Sexton to pay a visit to Florida, where Woody would earn great acclaim as tarpon guide--for a bit more on that story, see page 97 of the book. Jim recently sent me a note to correct my details about the construction of the Kispiox Special, which I quote here. Jim explains that the fly's inventor, Karl Mausser, actually tied the hackle on at the collar, over the wing. I'm indebted to Jim for this information: "Karl Mausser’s KISPIOX SPECIAL was tied in the round by Karl; he put the hackle on after the wing. He complained to me many times about people describing the wrong tying technique for his fly. I knew Karl very well [since grade school in Burlingame]. 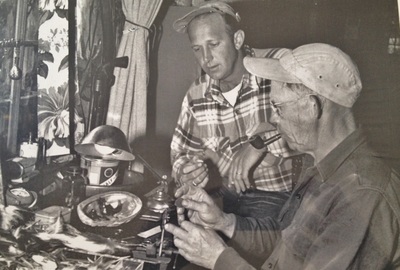 I was fishing with Karl on the Kispiox in 1962, but left before he caught his record fish. 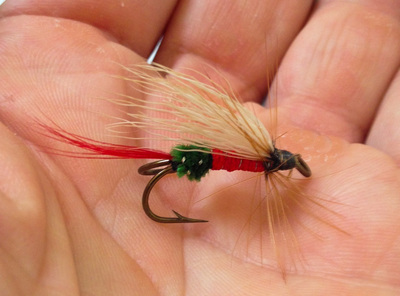 I always appreciated Joe Bates, because he tried to obtain flies from the originators, since the style of tying a fly is far more important than the actual materials used."